This six-volume series is a comprehensive learning material that focuses on spoken language in the first three volumes and written language in the latter three volumes. Volume One aims to strengthen daily conversation and applications; Volume Two contains short essays as supplementary readings; Volume Three introduces beginning-level written language and discourse, in addition to extended dialogues. 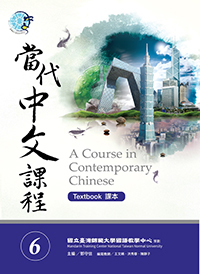 Volume Four uses discourse to solidify the learner’s written language and ability in reading authentic materials; Volumes Five and Six are arranged in topics such as society, technology, economics, politics, culture, and environment to help the learner expand their language utilisations in different domains. Each volume includes a textbook, a student workbook, and a teacher’s manual. In addition, Volume One and Two include a practice book for characters. The series adopts communicative language teaching and task-based learning to boost the learner’s Chinese ability. Each lesson has learning objectives and self-evaluation to give the learner a clear record of tasks completed. Lessons are authentic daily situations to help the learner learn in natural contexts. Lexical items and syntactic structures are presented and explained in functional, not structural, perspectives. Syntactic, i.e. grammatical, explanation includes functions, structures, pragmatics, and drills to guide the learner to proper usage. Classroom activities have specific learning objectives, activities, or tasks to help fortify learning while having fun. The “Bits of Chinese Culture” section of the lesson has authentic photographs to give the learner a deeper look at local Taiwanese culture. Online access provides supplementary materials for teachers & students. The Mandarin Training Center (MTC) was founded in 1956. The MTC, a subsidiary of National Taiwan Normal University (NTNU), is the largest and oldest institution dedicated to teaching Chinese as a second language in Taiwan. The center has well-equipped facilities and is internationally renowned for its high teaching quality. MTC’s students come from all over the world, and many renowned sinology scholars and important figures in the politics and financial are its alumni. Copyright © www.linkingbooks.com.tw All Rights Reserved.